Skip the greasy potato skins and turn them into a delicious appetizer that eats like a meal! These baked sweet potato skins are topped with spinach, spiced chicken, and cilantro, with a dollop of Greek yogurt instead of sour cream. Let Beachbody Super Trainer and Ultimate Portion Fix creator Autumn Calabrese and her brother chef Bobby Calabrese teach you how to make Loaded Sweet Potato Skins on FIXATE, the exclusive Beachbody On Demand cooking show. 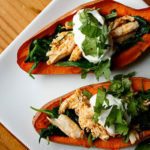 These healthier baked Sweet Potato Skins are topped with spinach, perfectly spiced chicken, and cilantro, with a dollop of Greek yogurt. Makes a great protein and FFC side as part of lunch.